SCOTTSDALE, Ariz. – January 22, 2018 – With notable celebrity appearances that included former President George W. Bush and an incredible docket of desirable vehicles, Barrett-Jackson’s 47th Annual Scottsdale Auction once again set the bar for the collector car hobby. In total 1,721 vehicles, nearly all at No Reserve, sold for more than $106.8 million, while over 1,100 pieces of automobilia brought in over $3.7 million, and $6.21 million was raised through the sale of charity vehicles, bringing the total auction sales to more than $116.7 million. Barrett-Jackson also reached an incredible milestone by helping to raise nearly $102 million for charity to date, largely through the sale of vehicles donated for a cause. At the Scottsdale event, 10 charity cars included a current-generation Ford GT (Lot #3010) that brought in $2.55 million. The sale of a 2018 Corvette Carbon 65 Edition (Lot #3007) generated $1.4 million, 100 percent of which will go to the former president’s Military Service Initiative. 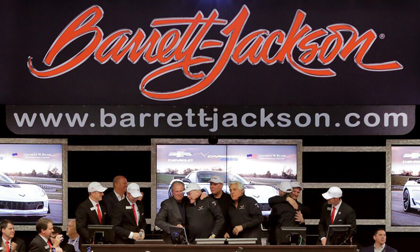 Barrett-Jackson also had one of its strongest opening weekends in history, and throughout the event hosted celebrity guests and athletes, including Jay Leno, Michael Phelps, Kenny Chesney, David Spade, Tim Allen, Alice Cooper, Bruce Arians, Alan Williams, Archie Bradley and Arizona Governor Doug Ducey. Also among the 10 charity vehicles that crossed the Scottsdale block was the first production 2019 Corvette ZR1 (Lot # 3009) that sold for $925,000. Carolyn and Craig Jackson’s Corvette 35th Anniversary brought in $350,000 (Lot #3008), and film star Chad McQueen was onstage as the VIN 001 2019 Ford Mustang Bullitt hammered for $300,000 (Lot #3006). Building off the remarkable 2018 Scottsdale Auction, the 16th Annual Barrett-Jackson Palm Beach Auction will run four days, April 12-15, 2018, at the South Florida Fairgrounds. Businessman John Staluppi, who purchased the 2018 Corvette Carbon 65 Edition for charity, will sell his prized 140-plus car collection from the Cars of Dreams Museum at the event. Consignments are now being accepted; for information on becoming a bidder, follow the link to www.barrett-jackson.com/bid. Information on available packages and how to be a part of this world-class lifestyle event is available here.